Genius loves company 10th Anniversary Edition. 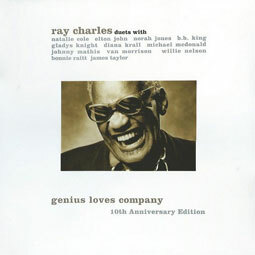 Genius Loves Company is the final studio album by rhythm and blues and soul musician Ray Charles, posthumously released August 31, 2004 on Concord Records. Recording sessions for the album took place between June 2003 and March 2004. The album consists of rhythm and blues, soul, country, blues, jazz and pop standards performed by Charles and several guest musicians. Tracklist : A1 Ray Charles With Norah Jones	Here We Go Again - A2 Ray Charles With James Taylor Sweet Potato Pipe - A3 Ray Charles With Diana Krall	You Don't Know Me - B1 Ray Charles With Elton John	Sorry Seems To Be The Hardest Word - B2 Ray Charles With Natalie Cole	Fever - B3	Ray Charles With Bonnie Raitt	Do I Ever Cross Your Mind? - C1 Ray Charles With Willie Nelson	It Was A Very Good Year - C2 Ray Charles, Michael McDonald	Hey Girl - C3 Ray Charles With B.B. King	Sinner's Prayer - D1 Ray Charles With Gladys Knight	Heaven Help Us All - D2 Ray Charles With Johnny Mathis	Over The Rainbow - D3 Ray Charles With Van Morrison	Crazy Love...... DOUBLE LP, gatefold release.